Chef isn’t just for standing up machines anymore. With so much riding on enterprise infrastructure, it’s tough to move things around with confidence, and to remain certain that everything you removed, moved or replaced is properly back online after such a shift. Chef has evolved to provide this sort of reassurance to IT administrators and developers, far beyond the original use case of provisioning and standing up single machines. Brittany Woods, automation engineer at vehicle information service Carfax, said that “I’m responsible for making sure Chef works for us, and making sure people’s lives are easier because of it. We are a Linux shop. Primarily, we use Chef. Exclusively we use Chef for Linux. We build the systems to support the products, and we Chef to make that happen, and we use Chef to manage those systems throughout their entire lifecycle,” said Woods. 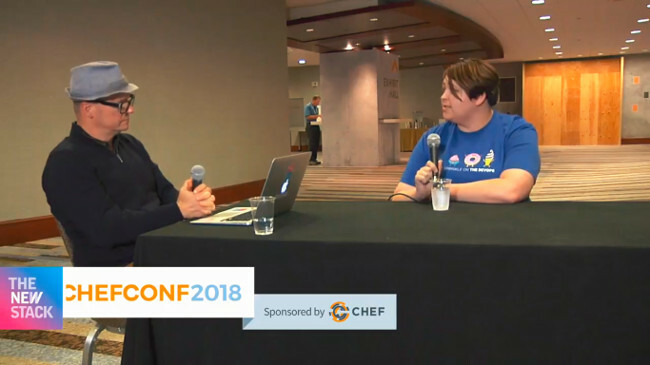 “Chef is our way to fully manage that architecture from configuration — configuration specific to apps, configuration specific to tooling that we use — basically the entire build of the system outside of provisioning, Woods said. “Right now we are comprised of several different smaller teams that maintain a different focus. What products they support, they maintain cookbooks for those products. My role is to make them successful. To ensure they have the tools they need to be successful, and also to manage the Chef architecture,” said Woods. Woods said that rolling out and supporting live applications took more time and could potentially introduce errors to a process, application or service. To remove these problems, the Carfax team relies on Chef to produce reliable configuration environments for their applications, ensuring a forgotten configuration option doesn’t take down an entire cluster. “You have this application that has to go live, and in order to have that application live you need the infrastructure to support that. Previously, it would take a lot longer to get a system out there for that application, which was of course essentially a bottleneck. The application was ready, the infrastructure wasn’t there. Now with Chef, we can not only illustrate a repeatable process throughout our environments for testing, and ensure that testing is going to look exactly like production is going to look, but we can also do it a lot faster because it’s someone pushing buttons instead of doing everything by hand,” said Woods. One challenge that remains for Woods and the Carfax teams is keeping everyone up to date with Chef. The company offers training based on both internal and external resources to get its team members up to speed because everyone puts their hands on Chef at some point. “We’ve developed an internal training. It’s a full day workshop where we get users in and we run them through the entire process. We explain how we use Chef at Carfax. We set up their user workstations so they can be successful when they leave and start right away. Then we also create a cookbook and run it through our pipelines and explain why we do it the way we do it,” said Woods. 1:04: What does Carfax’s infrastructure look like? 2:20: What role does Chef play in that architecture? 5:02: How does Chef allow you to move faster? 13:22: How do you bring your people up to speed with Chef? 17:29: What are the values of the Carfax organization?